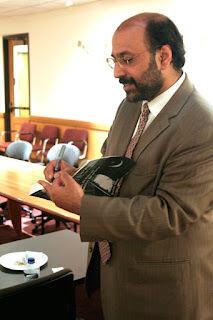 Acclaimed Pakistani author and educator Hassan Abbas told a packed Josef Korbel School of International Studies lecture audience that, despite increasing terrorist violence, his country's people embrace democracy and seek to put books, not guns, in the hands of their children. In the well-attended lecture on the future of Pakistan, Abbas focused on current challenges and possible solutions rather than historical events. "Too often, when people say they want to talk about the future, all they do is look to the past," Abbas said. About 150 Josef Korbel School students gathered to hear Abbas, a Bernard Schwartz Fellow at the New York-based Asia Society and author of the acclaimed Pakistan's Drift into Extremism: Allah, the Army and America's War on Terror. Abbas saluted the resilience of the Pakistani people and the vibrancy of Pakistani civil society  specifically the Lawyers Movement, which successfully challenged the 2007 removal of the country's chief justice by former military leader Gen. Pervez Musharraf. "The Lawyers Movement emphasized the rule of law in Pakistan" Abbas said, adding that the uprising demonstrated that, despite the country's tumultuous history of military rule, a strong desire for democracy endures. Evidence of that desire for democracy can be seen in the fact that in the country's 2008 elections, candidates advocating religious fundamentalism received less than 4 percent of the national vote, Abbas said. Josef Korbel School Professor Tahira Khan praised Abbas and said his book has made a difference for her students. "I have lived his book, choosing it for my courses to read for the past four years, and he was not repetitive at all," Khan said. "It really makes a difference to have him add the latest information; it is very inspiring." Professor Hassan Abbas is a Bernard Schwartz Fellow at the Asia Society and holds Quaid-i-Azam Chair at Columbia University in New York.